Saddle: Colle Gaudolino - North 39:54.778, East 016:10.562. How to get there: See the description for Serra Dolcedorme. Route description: This mountain is best climbed as a traverse from Colle Dell'Impiso to Colle Gaudolino using the trail that connects these two passes on the north-west side for the return. One can equally well do the traverse in the opposite direction. This way you get a round trip hike including a very nice ridge walk with good views. From the trailhead, hike up along the good trail (4WD quality) a very short stretch to the first pass, this is Colle Dell'Impiso. Do not descend, but take a ninety degree turn right and head uphill among the trees. There are several old trails here making zig-zag turns up the slope, however, due to limited use they may be slippery and sometimes hard to follow. Ignore these minor difficulties and continue uphill. Gradually, the ridge becomes more distinct, higher up you may run into a trail again, this time properly marked with red and white paint on the trees. 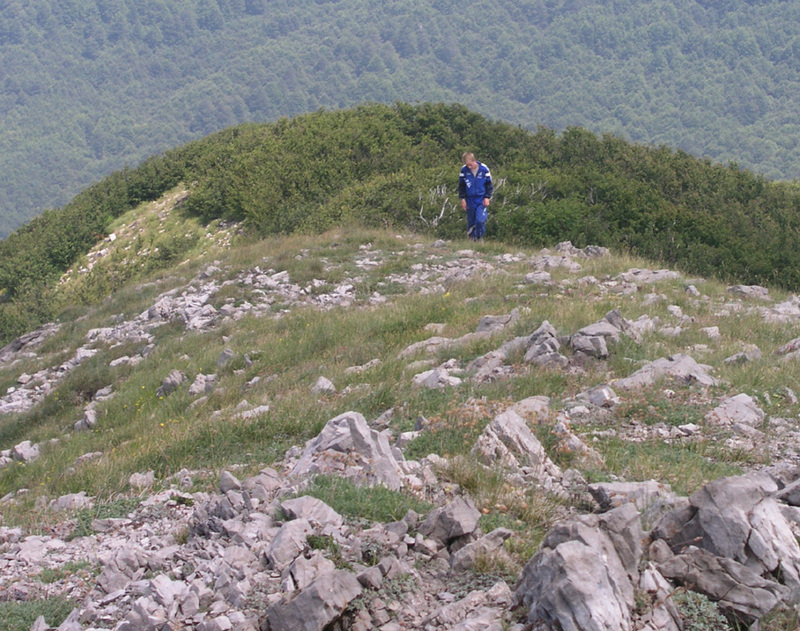 This trail emerges out of the forest and onto the open ridge at elevation 1974 meter, location N39:55.506, E016:09.545. Continue along the nice ridge to the summit. To complete the traverse, continue along the high ridge gradually curving left, then starting a gentle descent. You will run into the trees again at elevation 1950 meter, location N39:54.895, E016:10.182. Continue downhill, staying on the ridge or perhaps slightly on your left side until arrival in Colle Gaudolino, elevation 1695 meter, location N39:54.778, E016:10.562. From here, descend along the 4WD quality trail and follow it back to the valley floor at elevation 1460 meter. Finally, ascend along the trail back up to Colle Dell'Impiso in order to return to the trailhead from where you started out. 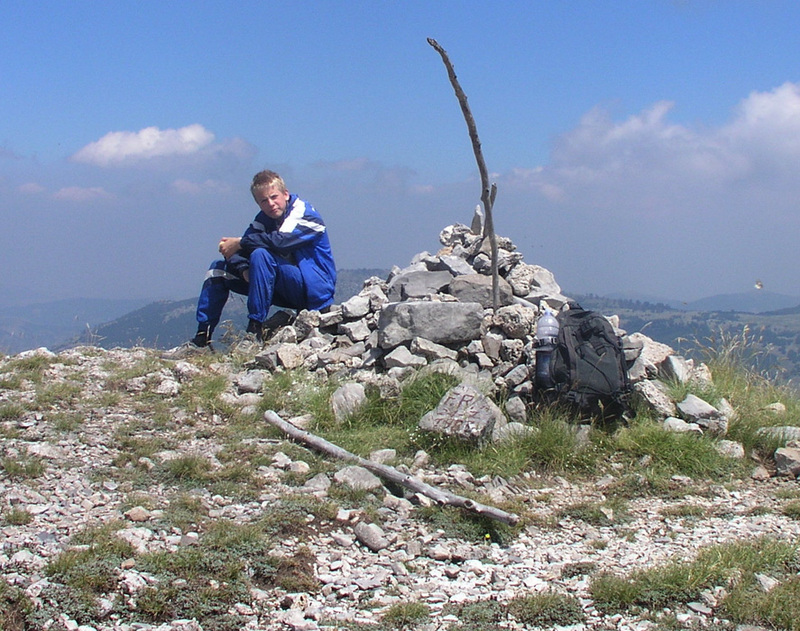 Comments: I did this hike with my son Pål Jørgen, age 16. We started from the pass Colle Gaudolino, that separates Serra del Prete from Monte Pollini at 1300, reached the summit at 1400, took a 10 minute rest for photo and water, then descended down the north ridge to the trailhead, arriving there at 1440. We had completed a traverse across the three highest peaks in Parco Nazionale del Pollini, this hike is about 15 kilometer long and requires 1600 vertical meter of ascent. The temperature was about 15 C when we started around 0800, but quickly rose to about 25 C. Sunshine the entire way calls for plenty of water, we carried 2 liter and that was about right for us. Very few people seem to hike these mountains, we did not see any. Moreover, the trails near the summits are very small and sometimes nonexistent. Similarly, in the forest, the trail had a thick layer of (slippery!) leafes. Frequent use would certainly tend to eliminate this. This traverse marked the end of our M5 project. Fourteen days of sunshine, nice hikes and a good family vacation in the Mediterranean, that also involved lots of swimming and interesting roads and scenery seen while driving. Thanks to Pål Jørgen for very good company in the mountains. 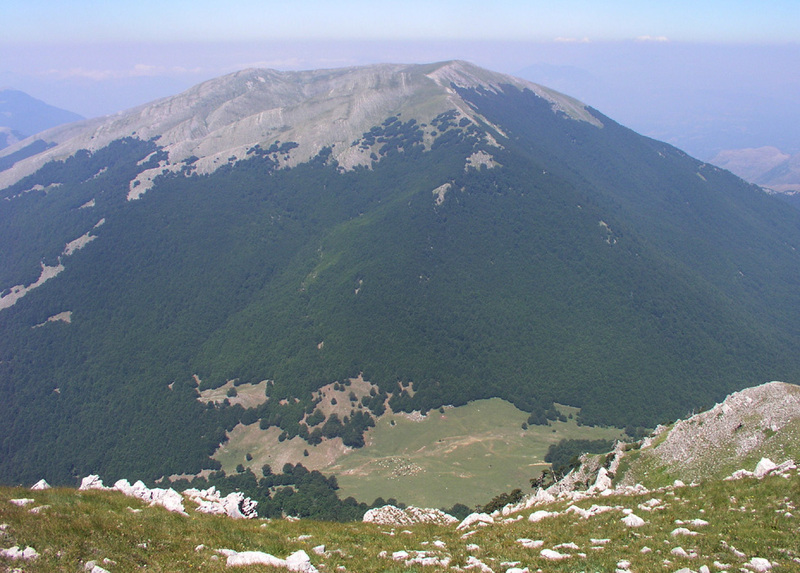 Serra del Prete as seen from Monte Pollino. 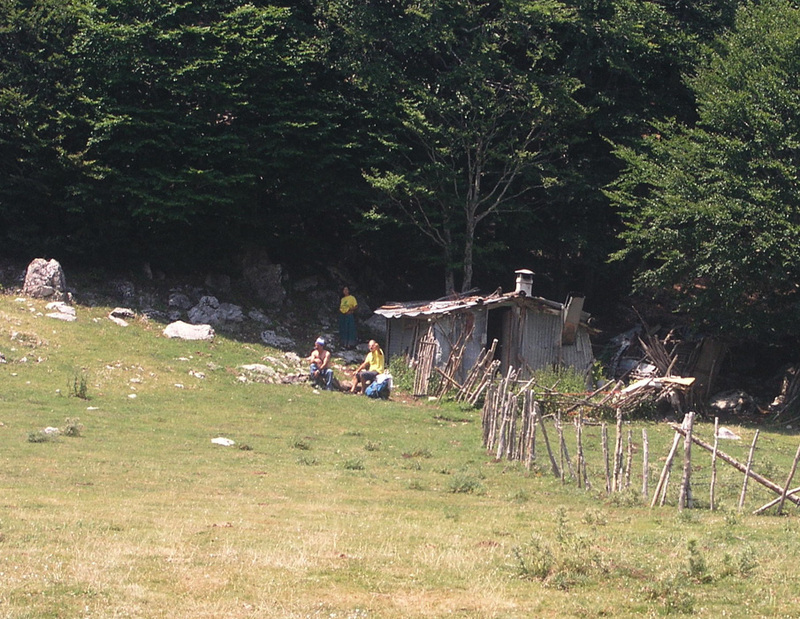 A shepherd hut in the deep pass named Colle Gaudolino. The ridge to Serra del Prete. Pål Jørgen breaking out of the trees. Perhaps a bit tired? 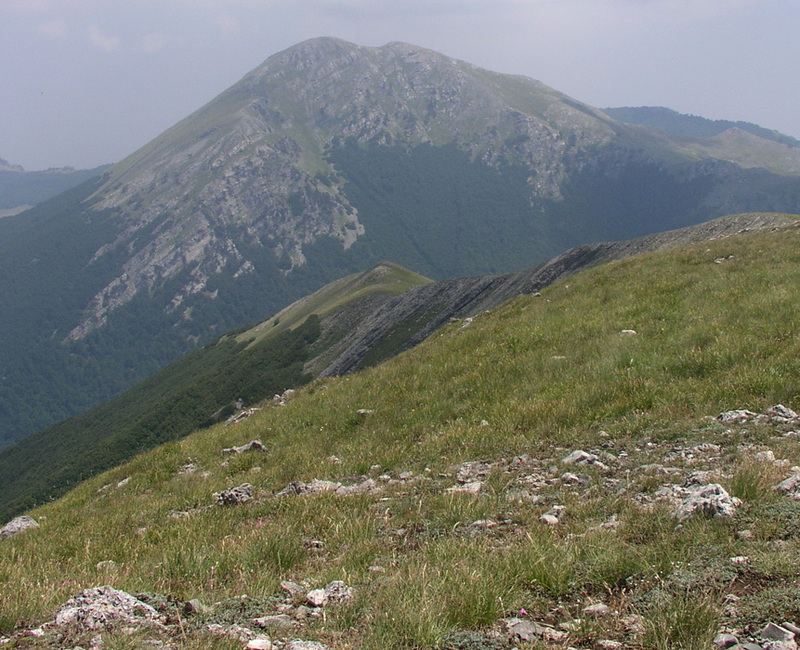 Monte Pollino, seen from Serra del Prete. The ridge of ascent in the foreground.